An entertaining book, if a bit disjointed much of the time. 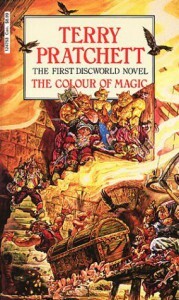 I've heard so many good things about Discworld that I felt I needed to see what the fuss was about. Colour of Magic left me interested for sure, albeit far from floored. The writing was decent and generally easy to read and follow, though the story was a bit jumpy at the best of times. There were many things that I found to be *funny*, but nothing I really outwardly laughed at (though I hear they get funnier as they go). All in all a decent intro book, enough to keep me interested in the story, though nothing I would call mindblowing.